Doksy is a small town north-east from Prague, Czech republic. The Baroque church is consecrated in honor of the apostle Bartholomeus. It contains currently two organs. These pages portrait the older instrument which may be seen on the picture on the left. The organ with one manual and a pedal was built in 1627. The organbuilder is unknown. The disposition of this instrument carries all the Renaissance signs. It has got one reed stop, a typical Renaissance Regal which is seated in front of the Prospekt-pipes. It is the old type of regal which was extinguished from organ building during the first half of 17th century. Its sound is harsh, even bleating, tends to instability and is hardly to be found elsewhere. There are also no wooden pipes as all the pipes are made of tin. The pedal has unusual compass of two octaves to allow performing the cantus firmus of the Renaissance compositions. The organ preserves the mean tone tuning. The organ was sold in 1787 to the church of Kruh. During the 19th century it was well mantained by local craftsmen. The pedal Octavbass was added. The lot of the organ in the 20th century was very misfortunate. The citizens of the village Kruh were expelled from the country after the Second World War because of their predominantly German origin. The church with its organ was abandoned and left to slow decay. The organ was heavily devastated by vandals during the time of the communist rule in the Czech republic (former Czechoslovakia). The organ was completely renovated by Vladimir Slajch in 1995 thanks to the generous donation of the former German inhabitants. It was restored to the original Renaissance shape. However, it was moved to its primordial ambience: to the church of Doksy as the church of Kruh is in very bad condition. 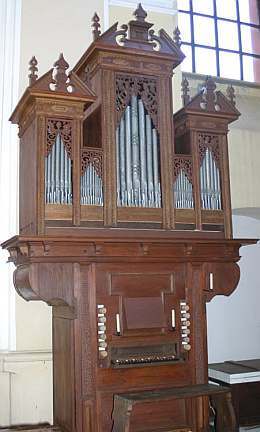 So, after decades of destruction, the organists have now again the possibility to play this unique instrument in its original form. The masterpieces of Renaissance and early Baroque sound absolutely marvelous performed on this type of organ. Tomáš Horák, Varhany a varhanáři na českolipsku. Česká lípa, 1996.